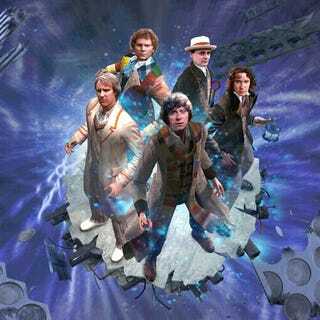 The Light at the End, Big Finish's multi-doctor anniversary special audio play comes out this November, on Doctor Who's 50th Birthday itself. It's already got a swanky 5-disc special edition, but now they're offering an even swankier version on Vinyl - which also comes with a completely petrifying lenticular image. The special edition of the drama is limited to 500 copies, featuring 4 180g heavy vinyl records, including the play itself and a special behind the scenes documentary, all wrapped in a four way gatefold sleeve. Aside from the vinyl the edition comes with professional photos of the participating cast, as well as a 30cmx30cm version of the Lenticular up top, featuring the faces of the Fourth, Fifth, Sixth, Seventh and Eighth Doctors staring out at you from the abyss, watching your every movement for eternity.